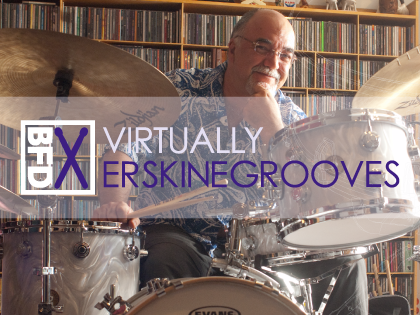 Virtually Erskine Grooves is a BFD Groove Pack with over 400 patterns played by legendary drummer Peter Erskine. Although intended to accompany the BFD Virtually Erskine expansion pack, the included Grooves can be used with any kits from any library in your BFD3, BFD Eco or BFD2 installation to enhance your productions with Peter's precise and incredibly funky drumming. The selection features Peter playing 12 unique styles in 3/4 and 4/4 time signatures covering jazz, swing, rock, funk and Afro-Cuban genres. Virtually Erskine Grooves is produced by Cymbal Masters. "Teamed with the Virtually Erskine BFD sound library (cm210, 9/10), this really is like having the man himself at your bidding."